Quiet Life: The heart and soul of Paris. 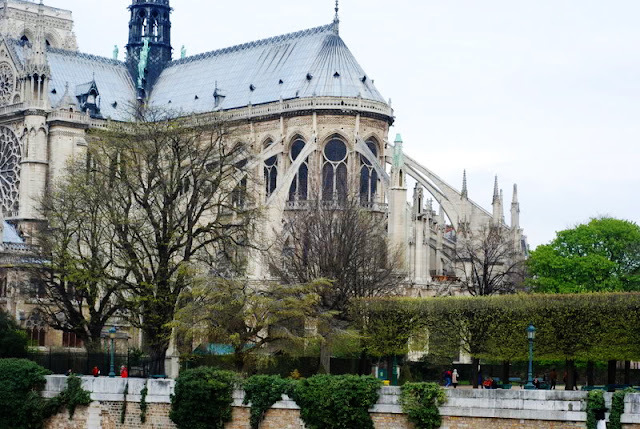 I learned about the flying buttresses in art class in college in 1979. I've since pointed them out whenever I get the chance. When Katie visited Notre Dame a few weeks ago. I told her to note them and she sent me a picture and just said, "noted". Today when I saw on Twitter that Notre Dame was on fire I was horrified. I was at school so I had to hold in the tears, but it was so hard to do. My heart is broken for the congregation, for the French, and for people who love art and history all over the world. To me this was the most important building in the world. It was beyond precious and beautiful. When the sun comes up tomorrow we will see and mourn, even greater I'm fear, what is left of this, the loveliest of buildings. It's been shocking to watch unfold. I think in my head I thought "it's made of stone, it can't burn" but of course that's not all there is to it. I wish I had seen it. Is Katie still in Paris? Katie is returning to Paris tomorrow. I think she will feel the sadness. Then coming home Thursday. What a bookend to her travels. Joy and then heartache. Prayers for safe travels for Katie. Beautiful words about a heartbreaking situation. So glad Katie was able to see that beauty so recently. It's still so unbelievable.